KEMBA Credit Union is a leading member-owned financial cooperative located in the greater Cincinnati area. KEMBA, also known as Kroger Employee Mutual Benefits Association, was founded in 1933 by a group of employees from The Kroger Company – one of the largest retailers in the world today. Today, KEMBA has nearly $1 billion in assets and serves more than 97,000 members, which include Kroger associates, employees of over 500 select employer groups, and communities throughout 24 counties in Ohio, Kentucky and Indiana. With 12 branches, a full line of Online and Mobile Banking services, more than 50,000 ATMs, and over 5,500 shared branching locations nationwide, KEMBA remains strong and committed to providing members with financial products and services of the highest quality and value. Service is at the heart of KEMBA’s cooperative mission so the credit union is always looking for ways to increase efficiencies and security. While KEMBA was planning to update its Blue Ash branch to a more interactive teller pod environment, it realized the need to improve its cash-handling processes. Manual cash handling demanded a large amount of time and resources. Operating under the principle of counting cash three times was time-consuming and reduced personalized interactions with members. End-of-day cash balancing led to overtime, increasing operational and staff costs. Performing “vault buys” throughout the day was also a time-consuming task. Vault transactions required “dual control” to authenticate cash amounts and often involved a head teller. On a busy day, tellers had to get into the vault five and six times a day. In addition, a shift to a more open branch design presented security risks. It would allow people to be up close and around the cash transactions. KEMBA needed a solution which would streamline cash-handling processes, while allowing associates to handle member transactions in a safe, secure way. KEMBA chose the Gunnebo SafeRecycling TCR7 teller cash recycler for its cash automation needs. The TCR7 provides an efficient front-office solution for fast and secure cash processing. The full-service, intelligent cash recycler automatically accepts, verifies, counts, and stores notes at the point of each transaction. The system is configured so that staff can quickly deposit and dispense cash themselves throughout the day. The TCR7 also serves as a “virtual vault” for the branch. It stores cash in secure cassettes and recycles it back to the associates. The system keeps a constant check on cash levels and provides automatic reconciliation at the end of the day. This reduces the amount of cash in their drawers, eliminates frequent trips to the main vault and speeds end-of-day cash balancing. The TCR7 has significantly improved KEMBA’s services while reducing overall branch costs. When a member needs to make a large withdrawal, such as $7,000 or $8,000, the tellers can quickly dispense the cash from the TCR7 instead of waiting for a teller to get into the vault — which is a huge time saver according to Dix. The branch manager is also connected to the cash recycler, making it faster and easier to serve members. 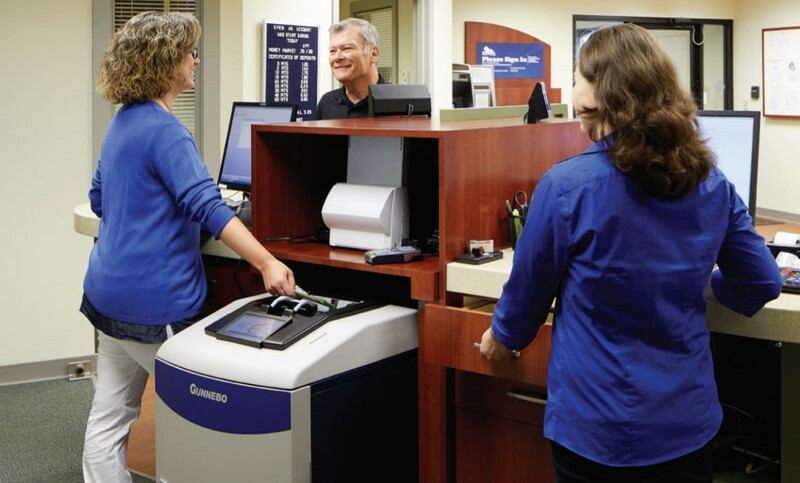 Using the TCR7, the tellers are more accurate and quickly balance their drawers at the end of the day. Overtime costs which often resulted from having to manually count the notes is now a thing of the past. With the new teller cash recycler in place, KEMBA also enjoys the system’s ease of use.